What causes hair loss in women are habits, nutrition or genetic. Stay tuned and discover some tips to prevent it. Hair loss is evidently less frequent in women than in men. It is a natural process that appears with the passage of time, in some earlier than in others. However, there are many solutions to curb hair loss. Here we will tell you about it. Are you one of those people who have noticed that your hair is falling more and more often? We recommend that you follow the following tips to stop this problem. During our youth we can lose between 50 and 80 strands of hair daily. This happens because the life cycle of each one is from 2 to 7 years. Once that cycle is completed, each hair follicle is prepared to form a new hair in a period of approximately three months. Poor nutrition, some diseases and treatments, nervousness, stress, hormonal changes and genetics are what causes hair loss in women. Also some external agents, such as hot climates, chemicals, dryers and irons, contribute to this problem. After the fall, new finer hair forms, with a shorter life cycle. When falling, the same process happens until the follicle closes completely and they no longer grow. Massaging the scalp helps prevent hair loss. It’s the simplest thing you can do to prevent hair loss. This does not entail any economic expense. Only if you wish, you can do it by applying almond oil or any other essential oil. Daily massage on the scalp promotes blood circulation and activates the hair follicle function. In addition, it is a relaxing technique. Rub onion juice on the scalp before sleeping and let it work overnight. Remove it in the morning with a good wash to prevent the smell from running out. Preparing it is very simple. To start, in a blender mix 1 peeled onion with the equivalent of a glass of water. Blend for several minutes until no lumps remain. It also works with garlic and ginger juice. The preparation of both is equal to that of onion juice. Use only one juice each time, do not mix them. Another option that will help you stop hair loss is the water of potatoes and rosemary. It is very economical and easy to prepare. You can wash your hair with it without having to rinse it again. Cut the potatoes into slices. In a pot, mix them together with the rosemary leaves and boil them in a liter of water. Strain the preparation and let it rest. Wash your hair as usual and use this mixture as a rinse at room temperature every day. The amount of ingredients will depend on the length of your hair. Extract of aloe Vera lying on the hair. Aloe Vera contains incredible benefits to prevent hair loss. Prepare a juice with aloe Vera and coconut oil to strengthen your hair. Apply it to the hair, let it act for half an hour and then wash it with the shampoo and conditioner of your choice. To start, take an Aloe leaf, peel it to extract the glass and wash it very well. Then, in the blender, process the glass with three drops of coconut oil. Then, once a homogeneous mixture forms, apply it from root to tip. You can substitute coconut oil for olive or almond oil, according to your preference. Do not worry about the smell of Aloe vera, because the oil will hide it. Finally, repeat the application once a week. Include more protein-rich foods in your daily diet to curb hair loss. Most foods rich in protein also contain vitamin B12, which strengthens it. Remember that the correct functioning of our organism depends on our diet. This includes increasing the production of collagen and other compounds essential for hair health. What causes hair loss in women is stress, believe it or not. Practice some physical activity such as walking, swimming, riding a bicycle or the sport of your choice, for a minimum of half an hour a day every day. Doing yoga also helps decrease stress levels. Talking to a trusted person or a specialist when you are facing certain situations helps to reduce stress. Another option to calm your level of anxiety, nerves and stress is to take teas or herbal infusions such as chamomile. Many times we stop taking vitamins when we are adults. Vitamin A is an antioxidant that stimulates the sebaceous gland in the scalp. Vitamin B contributes to the production of melanin, which in turn stimulates blood circulation. For its part, vitamin E also promotes circulation and keeps hair follicles healthy and active. It is not necessary to invest a lot of money and time to stop hair loss. However, there are commercial products of excellent quality. You can take the option that nature offers us. Just by following these tips and creating new habits you will succeed in keeping each hair in its place. This way you will show off spectacular hair for a longer time. 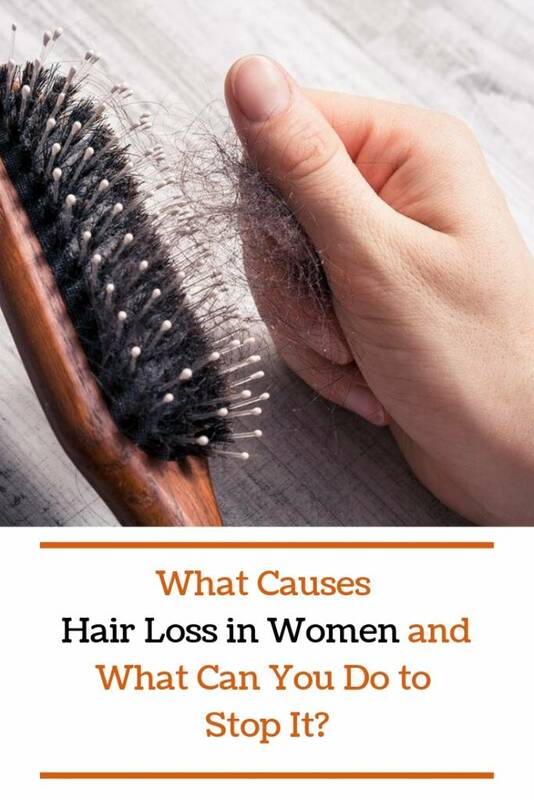 Don’t forget to SHARE what causes hair loss in women with your friends and family members on your social networks!